Despite showing resilience on the back of bond selling and the consequent enhancement of bond yields in recent weeks, the Single Currency’s dominant downtrend, which has been apparent since the start of the first quarter of 2014, is still in place. The exchange rate has reversed to the downside, with almost mathematical precision (see chart), from a nine-week correction at a point that would correspond to this trend line. The correction that had been in train prior to that was in spite of Greek woes, and the combined effects of Euro zone Quantitative Easing and a signalled determination on the part of the US monetary authorities to begin raising interest rates before the end of this year. These constitute a vital divergence between US and Eurozone monetary policy. 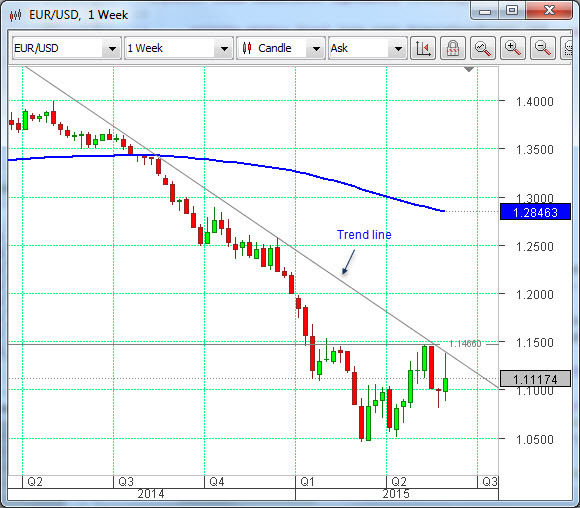 Now, it would appear, those influences might have once more become the most important ones for the EURUSD pair. Later this week, on Wednesday, we will have the monetary policy statement, economic projections and interest rate decision from the US Federal Open Market Committee (FOMC), which will be closely watched for further indications of when said interest rates in the US might begin a rising sequence. This Fed meeting is of more than ordinary importance as it is one that will be followed by a press conference hosted by the Fed chair, Janet Yellen. It is also the one (June) that was at one stage earlier this year touted as the occasion on which rates could begin to rise. That is now unlikely. Thursday of this week will see a Eurogroup meeting. This will, undoubtedly, be dominated by the Greek question. We may have more information at that stage about the direction that the crisis will have taken. This morning the Financial Times is reporting that “Greek default fears rise as ‘eleventh hour’ talks collapse”, referring to yet one more failure yesterday (Sunday) to reach agreement.